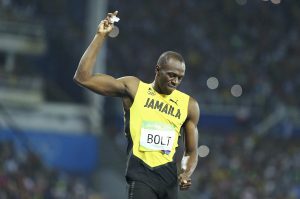 Usain Bolt has been stripped of one of his nine Olympic gold medals after a teammate tested positive for a banned substance. The International Olympic Committee said Wednesday that Jamaican runner Nesta Carter tested positive for the stimulant methylhexaneamine when his urine samples from the Beijing 2008 Olympics were reanalyzed. The substance is banned under Olympic anti-doping rules. As a result, the committee has disqualified Carter and the Jamaican team from the men’s 4x100m relay event, which the team had won in the 2008 Olympics. The IOC said the corresponding medals, pins and diplomas that were awarded to the athletes must be returned. Carter did not challenge the results. Trinidad and Tobago, which won the silver medal in the 2008 men’s 4x100m relay, will receive the gold medal. Japan and Brazil are expected to receive the silver and bronze medals, respectively. The committee also announced Russian athlete Tatiana Lebedeva, who participated in the women’s triple jump and the women’s long jump events in 2008, has been disqualified after testing positive for the steroid dehydrochlormethyltestosterone.